One of the biggest mistakes I see people making is skipping this step. In fact, if you watch the experts on social media you will never see them vacuuming. They just start washing the walls right away. This is a big mistake. No matter what your wall texture is there is going to be dust and cobwebs on the wall. Washing without vacuuming, especially if you have smoke/tar on the walls, leads to an even bigger mess. So start by configuring your vacuum with a brush attachment and start lightly brushing and sucking the dirt/dust off the wall. We recommend the Shark Duo Lift Away, The Hoover Hushtone Canister, or any vacuum with a pole, good suction, and a brush attachment. Another mistake people make is starting at the top. When you clean a wall gravity is not your friend. Starting at the top can lead to streaks of cleaning solution mixed with dirt trickling down the wall. Depending on the type of cleaning product you are using, trickles can make lines if not dealt with immediately and you find yourself wasting time scrambling after stray streams of liquid that can make your cleaning even harder. Starting at the bottom makes this a whole lot easier. Especially since walls tend to get cleaner as you go up the wall making things easier. The tools required depend totally on the level of cleaning required. I have listed what you will need in order of cleaning difficulty. Light to Moderate Cleaning – A spray bottle of solution, a magic eraser, a stack of microfiber cleaning cloths and a microfiber mop. Moderate to Heavy Cleaning – A bucket of Solution, a bucket of rinse solution, microfiber cleaning cloths, heavy-duty sponges and a magic eraser. While there are many solutions you can use to clean walls, I always suggest you think of your health first. For example, if you have heavy nicotine stains on your walls that would require Tri-Sodium Phosphate to remove, you might just be better off consulting a reputable painting company to come in and restore the walls. However, here are a few natural options we use that are highly effective. Basic Solution – Hot water mixed with 2-3 tablespoons of vinegar and 5-10 drops of essential oil in a spray bottle. Advanced Solution – Bucket containing 2 gallons of hot tap water, 6 tablespoons of seventh generation unscented dish detergent, 1 cup of baking soda and 10-15 drops of essential oil. Purification Essential Oil – When we clean walls, especially those with nicotine damage, we always use Purification Oil by Young Living. Purification is a wonderful oil to use in cleaning due to its uncanny ability to eliminate odors. Purification contains Citronella, Lavandin, Lemongrass, Rosemary, Myrtle, and Tea Tree essential oils and smells wonderful! 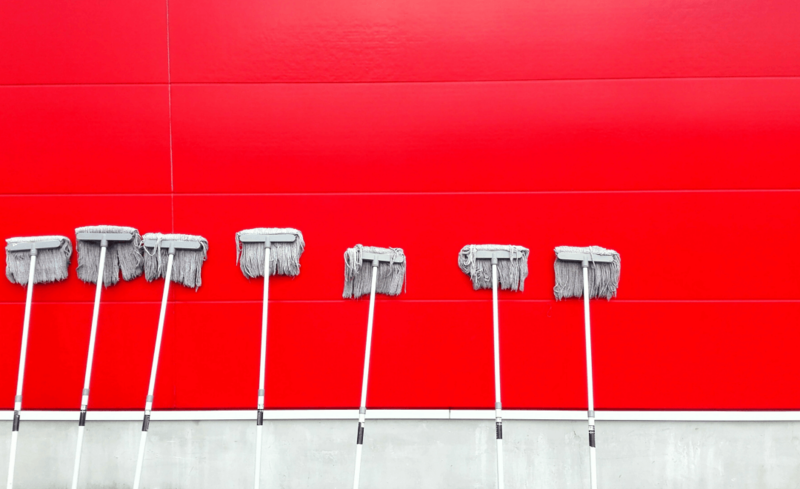 When it comes to actually cleaning walls a lot depends on your own assessment of what method works best for your situation. 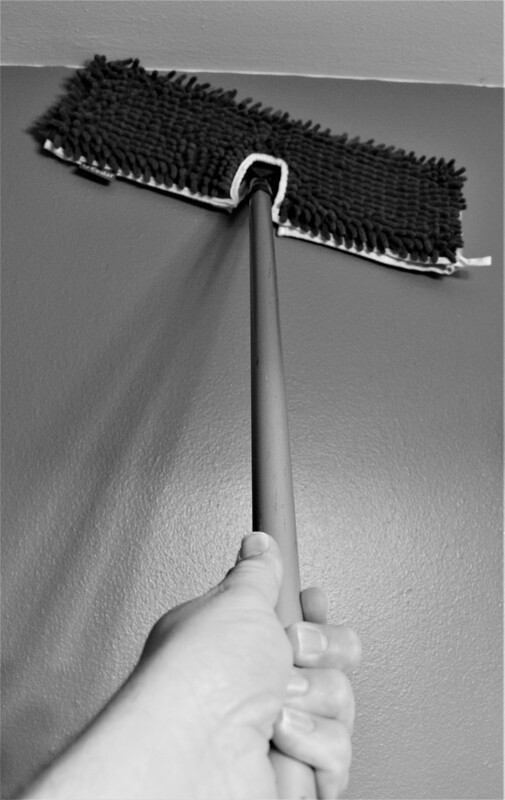 For light-moderate wall cleaning, we usually wipe the areas we can reach by hand using a spray bottle containing basic solution and microfiber, and then use a good microfiber mop to stretch to the high up places. When heavy cleaning is required it is usually a good idea to start by cleaning one section at a time. Using the advanced solution and a microfiber cloth, clean one section and then rinse with a damp sponge. It is a labor-intensive process but will be extremely rewarding. After you are done cleaning your walls it is imperative you change your air filters, clean your vents, and if needed have your ducts cleaned. While walls can get dirty with fingerprints and the like, air circulation is the biggest culprit. All of that dust and dirt gets on the wall by the circulation in your home. If you have poor air filtration dust builds up quicker and you will be right back cleaning your walls in a few months.